30. What kind of City Council do we want? Atherton residents will soon be submitting their ballots with their choices for two candidates to fill seats on their council—which, for the first time since the new millenium, won’t include Kathy McKeithen. It is the town’s first opportunity to make a break from the polarizing style she brought to the council and seat new members committed to representing residents’ preferences, rather than their own ambitions. Even residents who don’t pay much attention to town events are aware that the council, throughout Ms. McKeithen’s long tenure, has been characterized by incivility, personal attacks, expensive settlements, inappropriate and excessive investigations, revolving door of senior staff and simply ridiculous amounts of controversy. Expensive litigation over Lindenwood urns, the Performing Arts Center and Menlo-Atherton field lights all come to mind, as do attacks on all town officials and improper charges and rebates of building and construction fees, as major drains on town funds and good will. McKeithen was perennially front and center of all of these problems. Luckily, we have a chance to break with this past, except for one disturbing notion: that apparently McKeithen has put forth a candidate to serve as her “heir apparent.” That candidate is Denise Kupperman, the long-serving chair of the ALBSC, McKeithen’s Library Committee. The Atherton Library Building Steering Committee is the group that’s been pushing McKeithen’s biggest and most polarizing of projects which is being voted on as Measure F. So, the question must be asked: could Kupperman possibly have the town’s best interests at heart in her run for City Council, or is she, as some contend, simply McKeithen’s proxy? 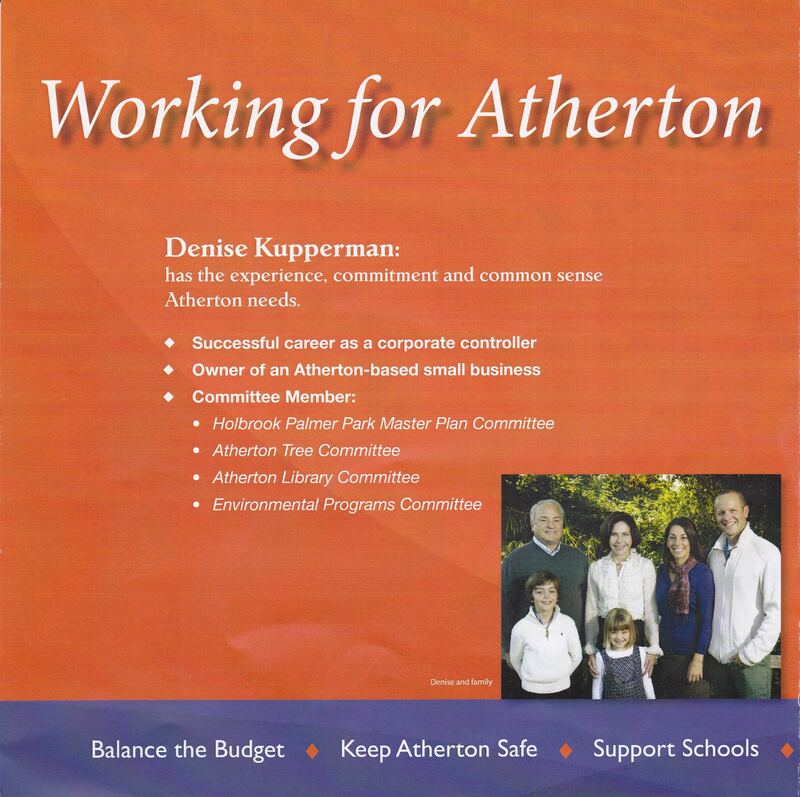 Given how important the new council will be in making post-election decisions about the Library, the ballpark, the Town Center and building good relations with the new Town Manager, it is critical that Atherton residents take a very close look at Ms. Kupperman and her ethics. Unfortunately, both Kupperman’s website and her glossy mailer that arrived at homes this past week raise serious questions about Kupperman’s honesty and integrity. Rather than proudly assert her “accomplishments” as Chair of the Library Committee, Ms. Kupperman totally downplays her involvement. As shown here, Kupperman calls herself a “Committee Member” and buries Library Committee at number 3 in a list. No mention of being the chair of this notorious committee! Which strikes me as rather two-faced. If everything the Library Committee did was perfectly legit, as Ms. Kupperman and her “Yes on F” friends so stridently assert, why does Kupperman completely fail to mention her leadership role as the Chair of that committee? We think this omission is clear acknowledgment that, as ALBSC chair, Kupperman did not exactly demonstrate “caring civic leadership,” as claimed on her flier. She’s white-washing her credentials, stepping away from the responsibility she’s had for the fiasco created by her Library Committee. It’s rather alarming how dishonest this presentation seems (she has no children of her own, either, as far as we know). Clearly, McKeithen and her ALBSC supporters like Kupperman. Many members of the ALBSC and their spouses signed her Candidate Filing papers as endorsers for council candidacy—including Councilmember McKeithen and her husband, Smith McKeithen. Yet, Kupperman chooses to leave both McKeithens off her list of endorsers on her flier and her website. In so choosing, Kupperman is clearly attempting to distance herself from McKeithen and hide the full truth about who supports her. While we can understand her reluctance to acknowledge this relationship, nevertheless, the impulse to control and limit information to prevent residents from getting the true picture is alarmingly reminiscent of the way McKeithen herself operates. 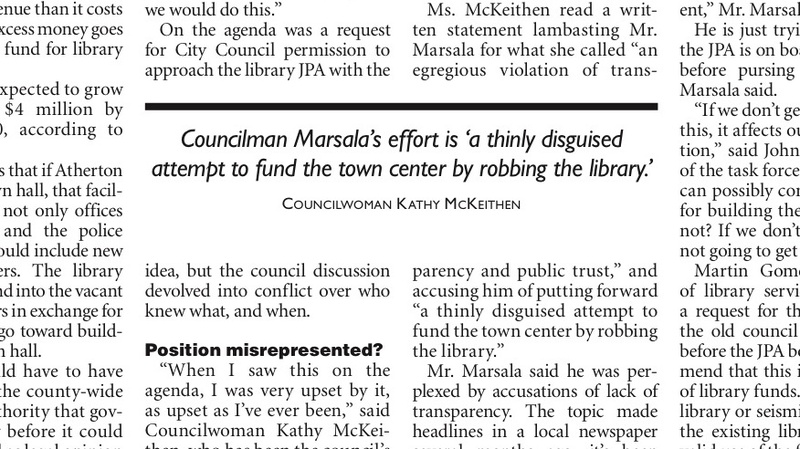 Covering up her role in the town’s great library controversy and her relationship with McKeithen are truly bad signs. We would prefer if she came clean and distanced herself by promising process reform and even to “recuse” herself from library votes for which she is conflicted. But Ms. Kupperman is not moved by honesty and goes in the other direction. She astonishes some in town in her effort to bolster her credentials as “Working for Atherton.” Her flier lists her membership on the “Environmental Programs Committee” right below “Atherton Library Committee.” Seems like this would be another one of her big, proud accomplishments — but the committee hasn’t even met once since being reconstituted with several brand new members, including Kupperman, a few months ago. Would Kupperman be trying to burnish her own credentials with the past notable accomplishments of what had once been a very vibrant committee? Mind you, this is the same committee that, at the end of 2011, McKeithen attacked, suspended, investigated and had pilloried in the press because of a blog post discussing the environmental impacts of moving a county library to the town’s park that she didn’t like. McKeithen, on behalf of the Kupperman and the ALBSC, forced the committee to unplug its own website and halt work mid-stream on a $100,000 home energy efficiency program, funded with tens of thousands of both town and federal grant dollars. Kupperman claims to have 16 years as an active and caring civic leader—and likes to depict herself working in gardens—yet she didn’t oppose McKeithen’s ongoing suspension of the EPC and the resulting waste of the committee’s efforts and funds. Was she working for Atherton then? Was this “caring civic leadership” that we can find credible? Another resident, Denise Kupperman said she likes the notion of high-speed rail combing the state with the population predictions. “It’s difficult to implement in a suburban corridor”, Kupperman said. “But ultimately it will happen”. So which is it? We get the all-too-familiar sense that this candidate has decided to say or do, or omit saying, whatever it takes to sound acceptable to residents. This double-speak is reminiscent of Ms. Kupperman’s obvious mentor, McKeithen. In another disturbing incident, the recent endorsement of Elizabeth Lewis and Cary Wiest by the Atherton Police Officers’ Association resulted in the standard McKeithen-style backlash. The APOA was accused of improper actions by the council majority, pilloried by the Alamanac and Kupperman was seen and heard screaming at both senior and junior members of the police force and town staff. Although the issue of outsourcing the police has not formally been raised at the council level, McKeithen’s well-known hostility towards the police and calls for outsourcing all police services to the county Sheriff, has made Kupperman’s position on outsourcing naturally suspect. Many people suspect, in fact, that McKeithen’s preference to move the library away from the town center has everything to do with depriving the town center of the library (and its tax funding) as an anchor for town center redevelopment. Thus, the decision on Measure F is actually tied into future decisions about police, and they have a right to endorse candidates on that basis. However, Kupperman’s response makes frightfully clear that we could be seeing a new McKeithen-like creature rising from the ashes. 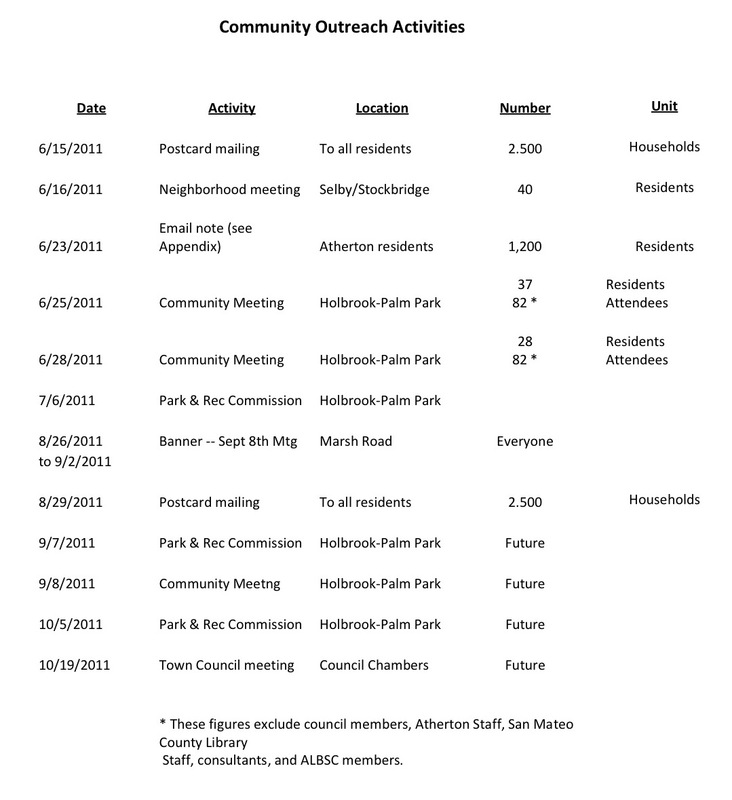 What kind of City Council do Atherton residents really want? Do we want to replace McKeithen with a canddidate with the same agenda, who is both closely tied to and beholden to McKeithen? Do we want someone who has demonstrated how well they have learned McKeithen’s unsavory tactics for manipulating facts and information to suit her goals — nowhere done better than with the Library Project? Do we really want to place power in the hands of someone who will verbally attack those who oppose her, including town police and staff? Or do we want to finally shake loose of McKeithen’s toxic, agenda-driven influence altogether? My preference would be to see us select council members with a proven track record and integrity. Elizabeth Lewis, the incumbent, has a highly respected track record and there are two other viable candidates, each with credible commitments to serving on behalf of Atherton residents and not their pre-existing agenda. Let’s focus on these! 27. Does McKeithen attempt to monopolize the airwaves? I find the campaign orchestrated by Ms. McKeithen and her apparently dwindling list of compatriots against the Athertonians group quite revealing. In the past, McKeithen could literally control the “airwaves” about any issue, first because she and Dobbie managed to censor the council minority members by eliminating their ability to get any of their concerns onto the council agenda, and second due apparently to close relationships with editors of the Almanac, most notably Ms. Rene Batti, who has been very obliging towards the ever headline-spewing McKeithen. Suddenly, with the emergence of the Internet and town email lists like Yahoogroups and Google Groups and even private blogs, McKeithen can no longer personally define what kind of information gets out. This appears to be infuriating for her. I took a look back at the articles, editorials and viewpoints published by the Almanac. While McKeithen and her friends are currently up in arms over “censorship” because the Athertonian spit out a bunch of those same individuals for attacking it, it seems that for the last few years, the only partisan views being published to the town have come from McKeithen and her Library cohorts. The focus of all of their efforts have been to push their Library Project on the town no matter what controversy it caused (they didn’t seem to care about that). Originally, they attacked the blue ribbon task force (“ponzi scheme” to rob the library), then the EPC (“illegal” operations), then the Town Center Task Force and more recently, they have attacked the Athertonians Yahoogroup moderators (informing the public—oops, we mean “name confusion”) — presumably because of posts that have called attention to key agenda items. Who are the folks pushing the library on the rest of us? I did a little research and I’ve come up with what seems like the list of McKeithen’s inner circle, whose impact, influence and power over the town, thanks primarily to a constant presence in the Almanac, are highly disproportionate to their numbers. 1. Kathy McKeithen: Member of Library Steering Committee, three-term Councilmember, Atherton’s representative on the Library JPA, and dominant player on many other town committees and commissions. 3. Smith McKeithen: Married to Kathy, attorney, actively attends many private meetings held by Kathy with town staff, so may serve as her private legal adviser. Instigated an attack by McKeithen on the EPC due to a post on the EPC’s website discussing the environmental impacts of moving a county building away from the town’s transit hub, as stated by McKeithen during a council meeting (citation coming). 4. Jim Dobbie: Councilmember Cohort and McKeithen backer, has reliably voted with McKeithen on all library matters, appears to do whatever she tells him to. As mayor, his big initiative was to discontinue rentals of park facilities (for the library) without council approval. Almanac Editorial: Ginny sent this partisan piece to the Athertonians Group and seems likely to have been the author – September, 2011. Instigated an attack by McKeithen on the Athertonians’ group because of its calling attention to the agenda for the council meeting that approved an additional $86,000 of town tax funds for EIR consultants due to town controversy in November, 2011. Authored the opinion that claimed that the Main House in Holbrook-Palmer Park is not historic in support of the Library’s plan to demolish the Main House. 11. Pat Dobbie: Wife of Jim Dobbie and vocal proponent of moving the Library to the Park. 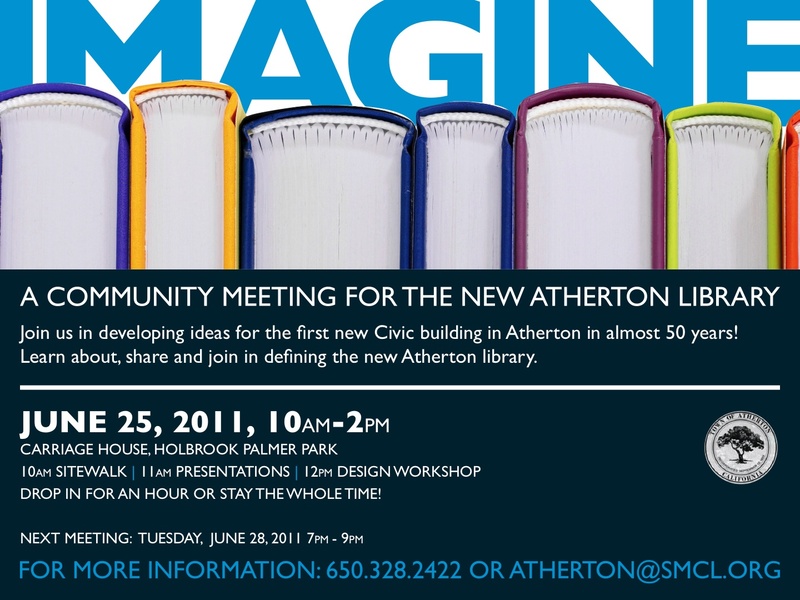 Active as observer and cohort to ALBSC and has advocated for Library in the park to the Atherton Garden Club. Also considered by some as likely anonymous commenter on the Almanac blog. 5. Why is it that McKeithen gets anything she wants published in the Almanac? McKeithen is certainly brazen about making unfounded accusations publicly, especially from her seat on the council bench. Frequently, her accusations are reported in the local paper instantly, as if the story was written simultaneously with her attacks. Also, it seems that many of those who support McKeithen’s positions get published “viewpoints. It seems that few of those who have opposing voices get published. Why is that? Does McKeithen have some personal connection with the management of the Almanac? She seems to wield the power to get published at will to her political advantage—is this why the playing field is so uneven in town and people are so afraid of her? The risk that the paper will publish anything she comes up with? 16. Kathy McKeithen is prosecuter, judge and jury in Atherton—but is there justice? McKeithen did not like something the EPC did, so she had her hatchet men, Danielson & Conners, string up the EPC. Under threat, they forced the committee to take down its website. They started an investigation (no doubt figuring out something that they could conceivably justify doing this for that was legal) and had the committee suspended in December. There was a formal investigation (with Jennifer Larson, City Attorney Conner’s daughter being hired to do the work) and the Almanac dutifully reported the accusations. Months later, it appears that the committee was completely cleared. Both the Assistant City Attorney and the City Attorney issued recommendations to reinstate the committee—whose biggest offense seems to have been following the protocols given to it by town staff, which were not in conformance with what today’s council finds appropriate process. (Ah, the benefits of hindsight and liberal interpretations of “misconduct!”) Then the Interim Town Manager recommended that the council reinstate the committee. The committee was never reinstated. McKeithen, found to be completely wrong about her accusations, never issued any apologies. The committee’s innovative energy program was trashed, wasting the federal stimulus funds and sponsorships the committee had raised. I have read what pro-library folks, like Walter Sleeth, keep telling us, that in their opinion, there were plenty of opportunities for members of the community to weigh in on the library, and that we “failed to heed all the notices for giving input.” The message is the library committee did its job and “residents failed to show up” but I’ve become skeptical that this is really true. Calls for referendums are misplaced in this instance, where more than 50 public meetings have been held and over a dozen community meetings. This postcard is the first notice to the community that I received. Did anyone get other notices that I missed? Seems rather bland, no specific information about where the process is. But then, suddenly, the committee spits out a very long report and recommendation to the council to put the library in the park. And to approve the EIR process, which by the way, the committee had already started working on in the spring, and oops, might as well approve that increase of almost $100,000 extra to pay increased EIR budget costs due to the public controversy)! How did I and everyone else miss hearing about the other 59 meetings? This seems like a pretty big discrepancy. I mean, the middle of summer can be a bit laid back, I grant. But missing 59 meetings? I don’t think so. I’ve already showed you # 1 and 2. Those are postcards about meetings. Apparently #7 was an email sent on June 23rd by the Town, which I didn’t get. Numbers 4, 5, and 6 were actual meetings but they don’t appear to have been noticed or advertised to the general community. These were, in fact, “Focus Groups.” I certainly did not hear about them and there is no notice posted showing how these groups were set up. Did anyone else get notice of them? Still, that brings the number of actual meetings up to 6. (I have now reviewed the summaries of the Focus Groups—you should also! What a trip! I have to say, using these three focus group meetings to bolster their case of having “engaged the community” seems rather lame. In one case, the “Parent Focus group,” the library folks state that they simply recruited six random moms and one nanny who happened to be hanging around the library during story time, to ask them some questions. The “Teens” group, they interview a classroom of Menlo-Atherton sophomores and juniors (only one of which admits to having ever been to the Atherton library) about what they want in a library—but they never ask these kids whether they’d prefer to have an extra playing field, versus a library in the park, which seems to me to be rather pointless given the task at hand. 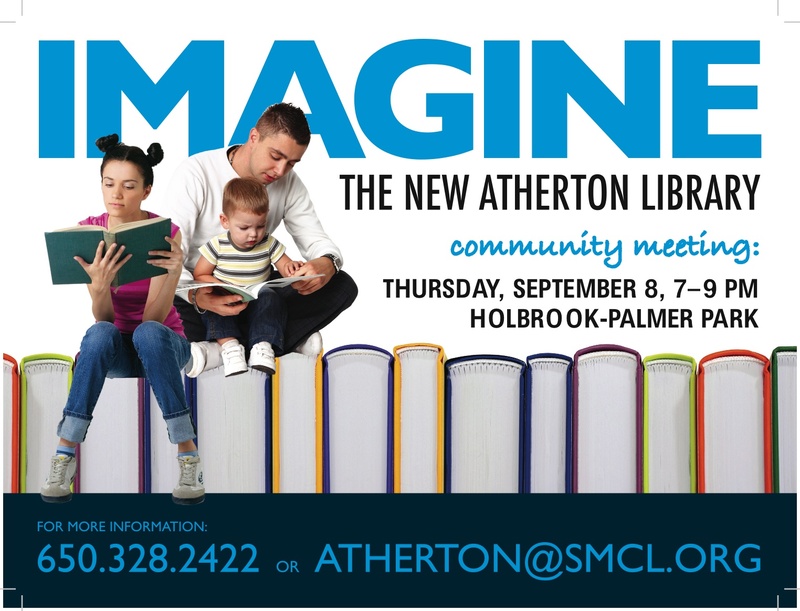 The third focus group is comprised of a very small group of Atherton Heritage folks, with overlap into the library committee’s own members and all they talk about is how much dedicated library space they would like to have for themselves. None of these “fccus” groups talk about, let alone provide any input for the location recommendation that the group made in October. How these even be said to be helpful evaluating the “location” options, when all they really discuss is configuration options, not relevant. So I take it back, we are still at three meetings. Unfortunately, this list only reproduces the other items already reviewed with one exception—a neighborhood meeting described as “Selby/Stockbridge”, with 40 residents attending. No summary is provided for this meeting. Can any report what happened there? When neither Ms. McKeithen’s Library website, nor any of the notices mention a word about the meeting process, how long it goes, what is covered, how the decision was made, is that transparent or responsive stewardship? When people complain that they are left out on the decision-making process, and Ms. McKeithen’s own committee refuses to listen to their concerns, complaints and legitimate objections, is that fostering respect and openness? Seeking input? But not using it? Like it or not, this Library project earns A BIG FAIL on process transparency and Design, Ms. McKeithen. With those three meetings essentially being all there was from your committee, you’d think the post card could at least say something like “Last chance to weigh in on important town decisions!” rather than “Drop in for any hour or stay for the whole thing.” That seem rather deceptive now, in retrospect. Especially since the only ones who knew what the process was, was the library folks. Real community engagement starts with some brain-storming but they eventually get down to serious discussions of pro’s and con’s about the use of the park and competing needs for open space. That part doesn’t seem to have happened at all—which really makes the results of the committee worthless—since there is no evidence that any other groups who care about the park were even given a chance to weigh in. Where are summaries of Dames input, ACIL input, Little League input, Lacrosse input, Park walkers, dog walkers, Playschool parents, etc.? Where are the lists of the ideas that came out of the brain-storming you asked people to do? The best explanation for where all those missing meeting are is that Mr. Dobbie is including the 33 committee meetings and special committee meetings held almost weekly by the library committee, not advertised, but promoted but which occupied committee members from apparently August, when the committee launched, until June, when the committee held its first real community meetings, advertised as such. I think I know the difference—as do most residents. So why would Dobbie try to make it sound like there were so many meetings with the community there? It seems that there has been such a continuous stream of hyperbole around all those 50 or 60 so called “public meetings” that even ordinarily highly thoughtful and intelligent residents like Mr. Sleeth can start believing these fictions. The real question is: how can Mayor Widmer (with a motto “Expect More”) condone this committee’s end run on meaningful community input, the failure to provide the community process transparency and the completely misleading messaging coming from marketing materials and members of the council, who should be protecting residents’ and the town’s interests, but who instead are very artfully attempting to convince residents that their frustration over not having any input on the project was their fault in the first place? 31. Is Distorting or Covering up the Truth a lie? 29. Will Kupperman be continuing McKeithen’s work? 28. Will the smell linger? 26. Will there be a candidate McKeithen in 2012? 1. How many people have been accused by Kathy McKeithen? 2. How many of those accused were ever found guilty of anything? 3. How many lawsuits has McKeithen supported on behalf of her Lindenwood neighbors? 4. Why does McKeithen attack the Atherton Police? 6. Why doesn’t McKeithen support efforts to revitalize our town center? 7. What or who is driving the City Council? 8. Who is out to get whom? 9. Why would McKeithen promote Widmer over Lewis? 10. Does Dobbie ever think for himself? 11. Why is the Library Project such a fiasco? 12. Would term limits help the situation in Atherton? 13. Who’s running the Town? 14. Is that Kathy McKeithen insulting others online? 15. Should residents have to pay for town staff to facilitate McKeithen’s politically-motivated crack-downs? 17. How does McKeithen maintain such a tight hold on town politics? 18. How much do McKeithen’s tactics cost residents? 19. Who should decide if a library fulfills the Palmer Will? 22. What motivates McKeithen’s long-standing antagonism with the Building Department? 23. What’s with all this hugely amassed library money? 24. What motivates Kathy McKeithen to cast aspersions towards the Atherton Police?